Barbara McClintock in the year 1983 received the Nobel Prize for the discovery of transposons in maize. 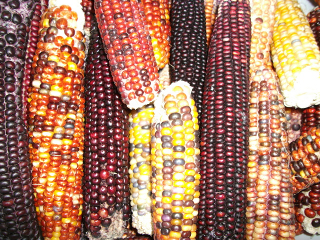 The kernel of wild variety of maize are purple, blue or black. This colour is the result of a molecule called anthocyanin. If the anthocyanin pathway in corn is disabled, the corn kernels are yellow. Yellow corn is a mutant. The molecule which gives corn its yellow colour belongs to the class Carotenoids. Corn kernels which are deficient in both, anthocyanins as well as carotenoids are white. During her studies on maize development and chromosomal breakages in maize, McClintock discovered that maize plants which develop patched kernels do not inherit this phenotype in a Mendelian fashion. Instead, they develop their colour patterns due to the action of transposons moving in and out of the genome. McClintock realized that the jumping genes whose effect she observed consisted of a two-component system - An activator element (Ac) and a dissociator element (Ds). Ac is able to transpose by itself, but transposition of Ds requires the presence of Ac; otherwise, Ds would be unable to move. Ds is derived from Ac by means of a truncation removing its transposase. Many Transposon insertions remain “silent”, though, because they are located within non-coding regions of the maize genome. What is a transposable genetic element? Flow of genetic information in cells. Function of the genetic code. What two elements are connected in a peptide bond of 2 amino acids? How is agrobacterium tumefaciens used in genetic engineering?